HOTEL YA AJABU DUNIANI - IMETENGENEZWA NA MCHANGA PEKEE ! 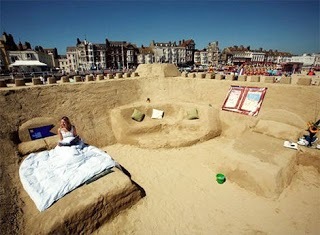 The world's first ever sand hotel has been opened in the Weymouth beach of Dorset, England.One can book to stay in this unique hotel for £10 a night, which includes beds made out of sand, until the rain washes it away! It took 1000 tonnes of sand and a team of four sculptors working 14 hours a day with the help of a JCB, for 7 days to build the sand hotel on Weymouth beach.